Free of charge. Registration not necessary. Courage Camp - Registration is open to Daring Way™ Facilitators and Facilitator Candidates. 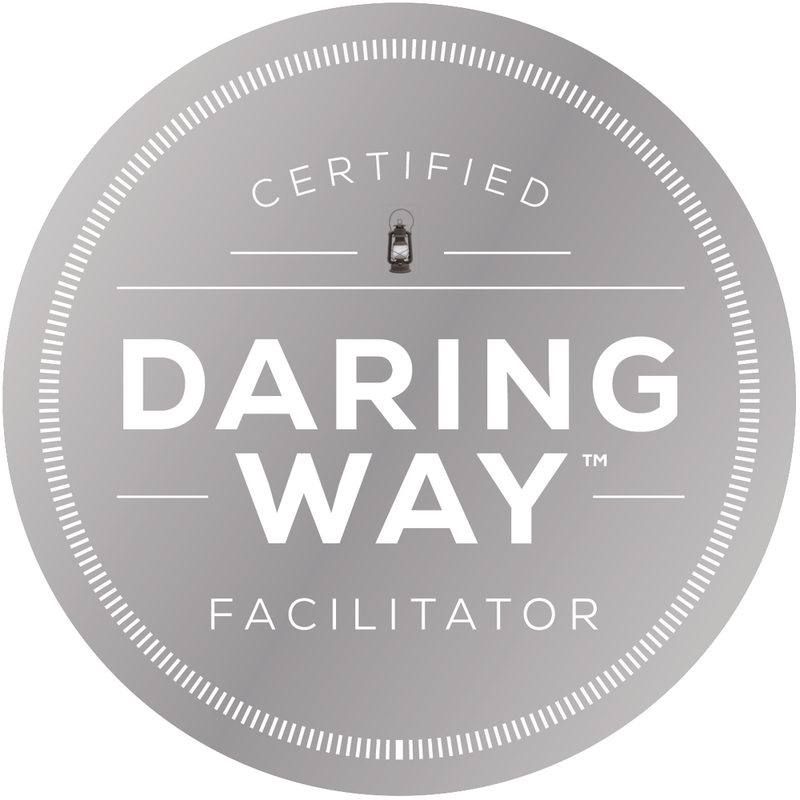 *To find out more about The Daring Way™ Facilitator certification process, go to www.thedaringway.com. 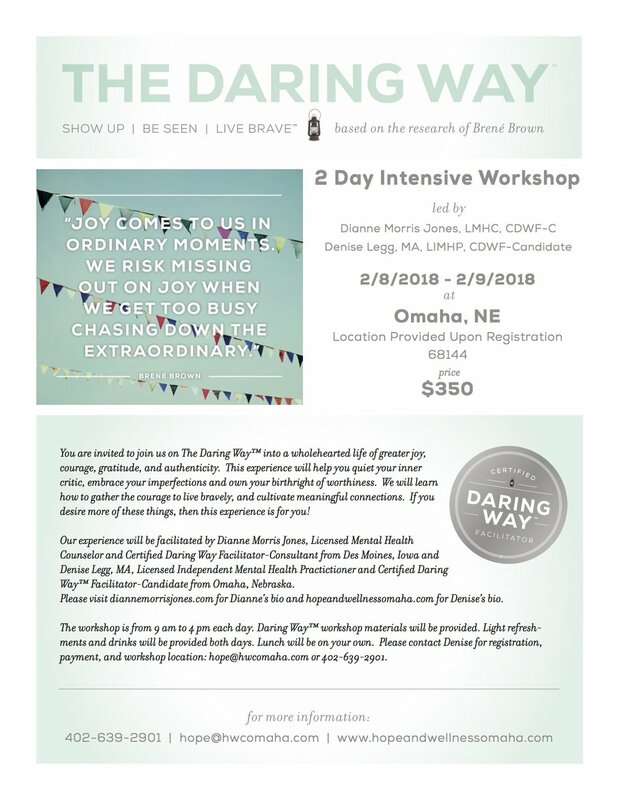 The Daring Way™ is a one-day workshop based on the work of Dr. Brené Brown. Participants can take this opportunity to learn how to show up, be seen and live brave in the challenging arenas of life. In this workshop we will learn about how to understand shame and move through shame towards wholeheartedness. Through experiential learning, we will explore key components of Dr. Brené Brown’s research regarding shame, vulnerability and wholehearted living. This workshop is sponsored by the Des Moines Pastoral Counseling Center. To register and for more information, please visit here. Dianne will be leading a laughter yoga session as part of PHC The Project's Team Building Day. This one-day workshop facilitated by Dianne Morris Jones, LMHC, CDWF-C and Nancy Schornack, LMHC, CDWF-C, is being offered by the Des Moines Pastoral Counseling Center. Community members, therapists, counselors, nurses, coaches, spiritual directors, clergy, teachers, parents, couples, adults, professionals, retirees, and anyone who is curious to learn more are invited to register. Early bird tuition: $85. After October 1st: $100. Please visit https://dmpcc.org/rising/ for more information and to register. 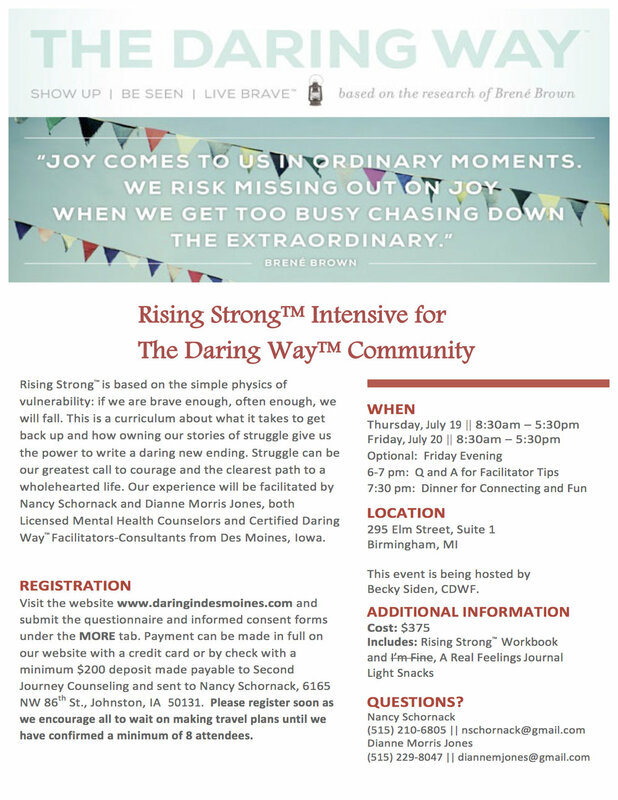 Rising Strong™ is a one-day workshop based on the research of Dr. Brené Brown. The simple physics of vulnerability is if we are brave enough, often enough, we will fall. This workshop is about what it takes to get back up and how owning our stories of struggle give us the power to write a brave new ending. Struggle can be our greatest call to courage and the clearest path to a wholehearted life.